OSWEGO – Following up on two previous successes, the writing team of Dr. Michael Nupuf and Laura Lowrie have prepared a new play, “The Doctor Can See You Now” that will be premiered by the Oswego Players as dinner theater at the Church of the Resurrection on Oct. 21 and 22. In a moment of suspense, Keila Gates, Michael Nupuf, Laura Lowrie and Ed Lewis react to Don DelPriorie, kneeling on the floor. Inez Parker, who directed the two prior productions, is also at the helm of this production. 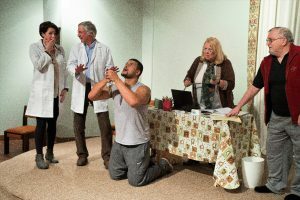 The play takes place in the doctor’s office in a small town in Upstate New York. Three generations of the Pines family have been dispensing medical advice, with the elder Dr. Peter Pines now retired, and his son, Dr. David Pines, and granddaughter, Emily, a nurse practitioner comprising the new medical team. Throughout the play, various couples come into the office, each at different stages in their lives, seeking advice and counsel. Dr. David and Emily use their medical expertise, compassion and common sense to treat their patients, not only their bodies, but also their minds, hearts and souls. The play, sometimes funny, sometimes a bit improbable, tragic and sad, but is always entertaining. The cast includes Chris Bixler, Dale Bixler, Laura Lowrie, Michael Nupuf, Donald DelPriorie, Payne Horning, Sonia Berlin, Ed Lewis, Bobby Fontana, Tammy Wilkinson, Michael Moss, Beverly Murtha, Jenn Snow, Guy Perticone, Keila Gates and Steve Standish. “The Doctor Can See You Now” will be performed at the Church of the Resurrection in Oswego, on Oct. 21 and 22. Dinner will be served at 6:30 p.m. with the show to follow at 7:30 p.m.
Reservations can be made by calling the Oswego Players’ box office at 343-5138.